No drivers are required to use the Odio with iOS, Windows, OS X and Linux systems. Audio Damage has released the Odio, a new class-compliant, rack-mountable 2-in/2-out USB audio interface that runs at modular audio levels. It's designed primarily for use with iOS devices, and for those who want to incorporate effect and instrument apps into their modular rig "for live performance or sketchpad recording". 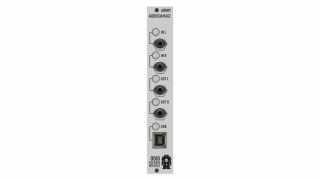 You might also consider using it with a Windows, Mac or Linux laptop, thus enabling you to incorporate plugin effects into your modular setup. Specs are below, and more details are on the Audio Damage website. The Odio costs $249 and is available from selected retailers. Audio runs at 10v p-p modular levels on both input and output. DC-coupled outputs for use with Silent Way, Volta, and other CV output software products. Easily record high-quality audio with your Instagram, Vimeo, YouTube, and Soundcloud apps directly on your phone. 80ma current draw from the +12V rail, 5ma on the -12v rail. No 5V required. 4HP wide, 53mm deep. May fit some skiffs and shallow cases; check your clearances.